Cleans, protects & polishes paint & all hard surfaces. Lasts 4 to 8 months - use one ounce twice a year. Easy to use - rub on & rub off. Does not stain plastic or rubber trim. No abrasives, silicone, was, polymer, or teflon. PAINT - all types including clear coats. PLASTIC - convertible windows, clear trim. FIBERGLASS - painted & gelcoat. GLASS - beads water on windshields. METALS - chrome, jewelry & all hard surfaces. 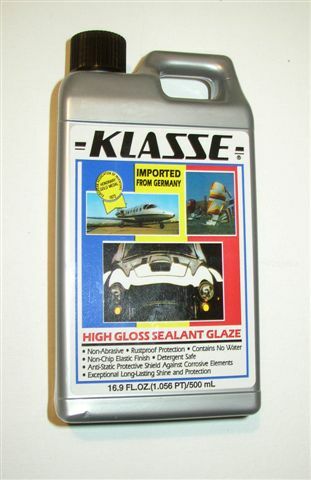 Klasse High Gloss Sealant Glaze provides more & longer acrylic protection. Although sometimes it can be a bit problematic in application, the trick is to let it dry for some time - from one hour to overnight. It works better this way & comes off easier. If some residue remains when wiping off, simply wipe with a damp cloth, or spritz with your favorite detail spray then wipe with a dry cloth. No problem. There is no other product that provides this unique kind of protection, helps fill in scratches, intensifies colors (especially black), and lasts so long. Protects paint at lease one year. 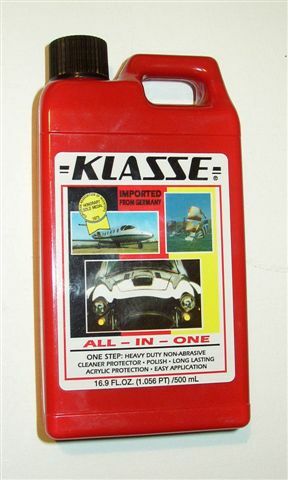 A dashboard treatment (not a greasy cosmetic) sunscreen with low shine that doesn't hold dust. For all vinyl & plastic surfaces inside & outside. Leather conditioner to keep leather soft & supple & looking good. Oil based but no animal fat. Completely dry within 15 to 30 seconds. Totally non-greasy/non tacky. No silicone. Copyright Parts for Imports Co. All rights reserved.